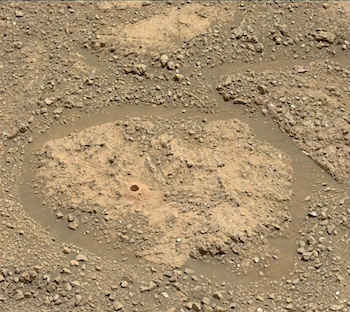 Sol 2265-75, December 19, 2018, update by MSL scientist Lucy Thompson: Planning today revolved around making sure that Curiosity has enough power after the Christmas holidays to be able to continue analyzing “Rock Hall,” the red Jura sample that we successfully drilled last weekend. We planned and uplinked 1 sol (sol = martian day) of science and diagnostic activities and 10 sols of REMS to take us through to the end of December. Tomorrow, our final day of planning before the MSL team takes a break for the holidays, we will plan Sols 2276 – 2278 to execute on Mars before the team here on Earth returns to nominal planning activities. This entry was posted in Reports and tagged Aeolis Mons, Curiosity, Fishertown, Gale Crater, Jura, Luskentyre, Mars Science Laboratory, Mount Sharp, MSL, Murray Formation, NASA, Rock Hall, Vera Rubin Ridge. Bookmark the permalink.